Just 3 days after the 6th of June 1944, USAAF Engineers achieved the unthinkable. 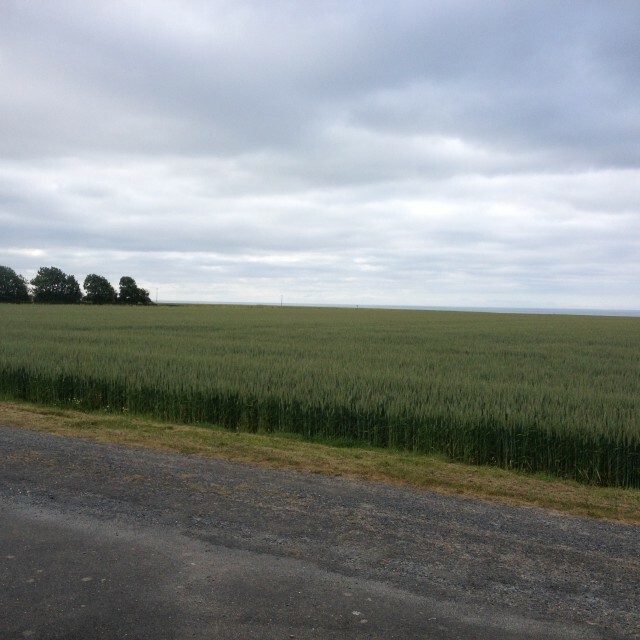 Right next to Omaha Beach on the Normandy coast at Saint Laurent sur Mer, a complete “Do-it-Youself” airstrip was constructed in a cornfield that overlooked the landing operations, that were still in full swing down there on the sandy shore, while the front line of a tank battle against SS Panzer divisions was only 25 km away to the South. 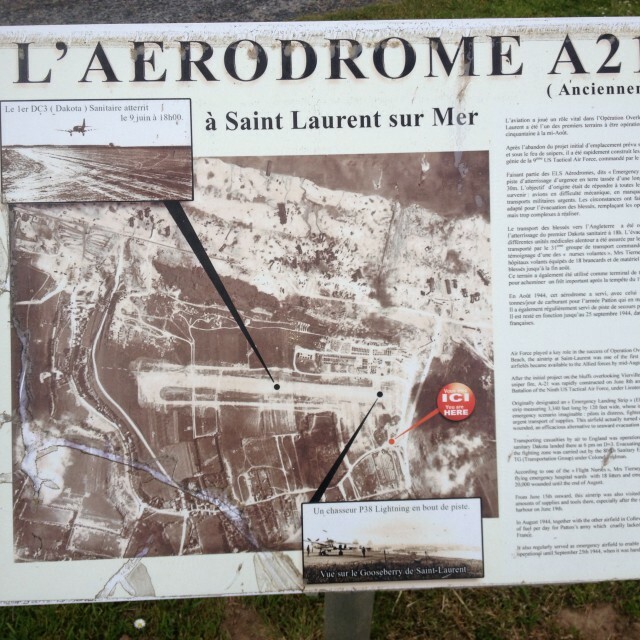 At 6.00 PM on 9 June 1944, the first C-47 landed on this Advanced Landing Ground (ALG) to pick up the first batch of seriously wounded soldiers, for evacuation to England. Not only the Dakota landed there, also the P-38 Lightning came to the first French “Pied-a-Terre” after D-Day. The twin boomed fighter swarmed over the battlefields of Normandy with Allied troops moving South toward their main target cities Caen, Bayeux and Carentan. The presence of this advanced air strip saved them flying time and distance, nullifying the crossing of the Channel for the re-loading of fuel and ammo. It gave them more time to attack and strafe the German tanks, the railroads and yards and other crucial infrastructure that could facilitate the Rommel strategy to wipe out the Allied forces by pinning them on the beaches and with the help of German Tank divisions, push the lightly armed Allied invasion troops back into the Channel. But that strategy was bound to fail, as the Allies came in with with a few surprises to get their feet firmly anchored on the Normandy Beaches within a couple of days after D-Day. First, they came with their own make shift harbors, the Mulberries that created in a matter of a week a huge arc of concrete caissons, that enabled the ships to unload heavy tanks, guns, mortars, ammo, fuel, food and transports for the 200.000+ soldiers that had landed with light arms only. Due to this genius invention, built in England since 1943, the Allies could fight the German Panzers with Tanks galore, outnumbering the Germans Tanks in matter of days. 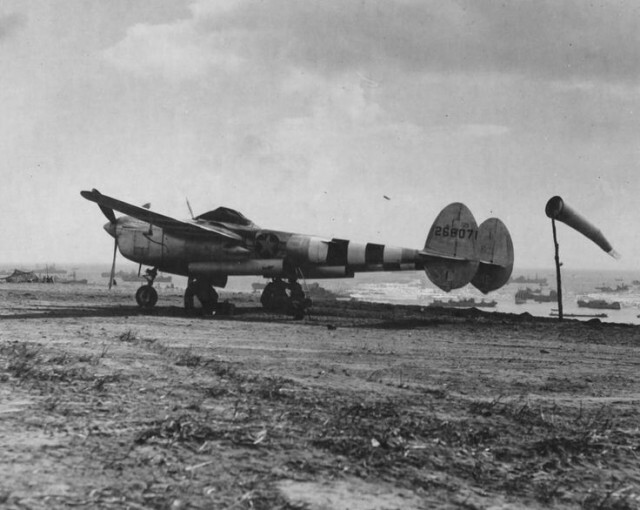 Another invention was the rapid deployment of ALG’s or instantly built airstirps for evacutaion, supply and close air support to the Allied troops that fought on the Normandy beach heads, spread over a region of some 100 kms/ 60 miles. The most common method to rapidly create an airstrip was with use of the Perforated Steel Planking (PSP, also known as Marsden matting), but that was heavy stuff , made of steel and time consuming to assemble in the open field. 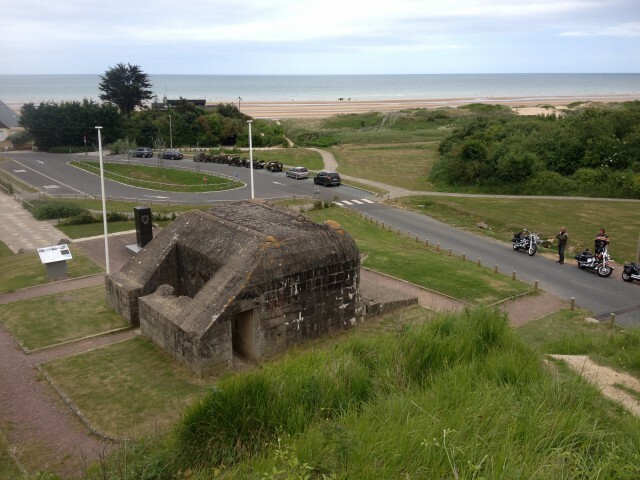 Both factors steel and time were very scarce in the first days after D-Day. 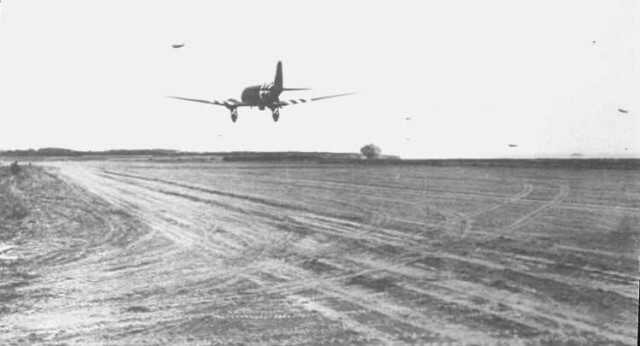 Yet, the versatile C-47 was (as usual) the first cargo transport to land on the first liberated strip of soil of continental Europe, right at the heart of the reinforced Atlantik Wall. How did they do that in only 3 days after the D-Day landings? Enter the Hessian Matting or Prefabricated Hessian Surfacing (PHS). The USAAF Engineers Carpet roller truck in action that applies the Hessian Matting over the soil of the corn field. 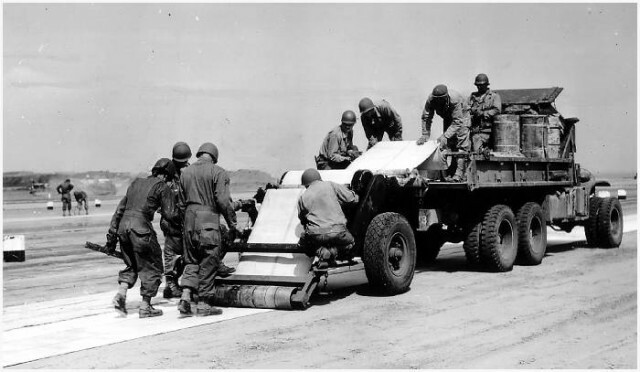 The USAAF engineers came in with a huge carpet roller system for a rapid surface treatment , known as Prefabricated Hessian (burlap) Surfacing (PBS) based on Bitumen base. It was light and easily transportable. With a flexible structure of jute, it was asphalt-impregnated and delivered in rolls 300 feet in length and 36 inches width, mounted on a truck and processed for glueing on a special heat treatment trailer (see photo), PBS was laid in overlapping layers to produce a dust-free surface, just good enough to carry the 13 tons of a fully charged Dakota. For carrying that weight, you need some serious hard (under) soil, but can be covered with sand, grass or gravel. The rolls were simply applied as a bitumen burlap on roofs. On top, sand was spread over sprinkled Diesel fuel to make the surface more sticky. (soil pollution was no issue yet in WWII). Blockhaus Normandy, This was a very lethal bunker, hardly noticed from the beach, it made many victims before being hit from a ship’s gun. The final shell went right into the bunker, pierced the gun inside and vaporised the 5 men crew instantly. As from that moment, the road to the plateau opened finally, and became the first major entry to the Normandy interior. 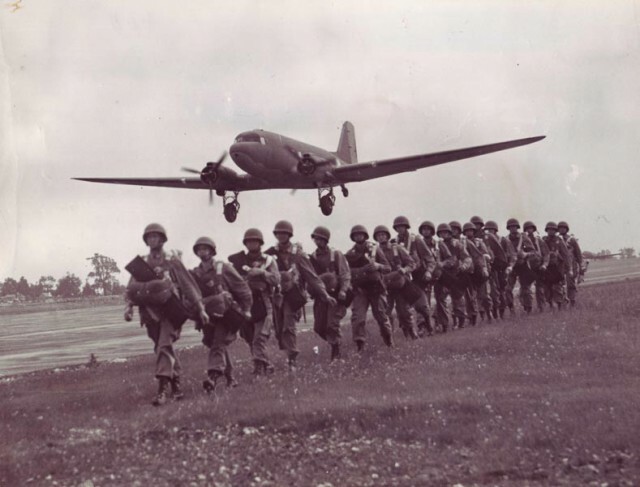 The need for more ALG’s and the flight of the C-47’s for supplies and evacuation of wounded soldiers soon sky rocketed beyond all previous planning as the advance to Germany’s borders started and distance from the supply ports became more critical . More than 280 ALG ‘s have been built in France, Belgium and Holland in a time span of less than 9 months. Cornfield Normandy, this is the corn field where the airstrip started, right at the top where the beach road enters the plateau. From the Normandy ALG A-2 alone (as depicted in the photos at Saint Laurent sur Mer), more than 11.000 soldiers were evacuated. This figure gives some impression of the role of that Dakota in the life saving missions which helped to create for the first time in history a massive air bridge for the wounded. Instead of being shipped, they were now flown to the British Hospitals in a matter of hours and that surely will have helped to save the life of many a soldier. No wonder that General Dwight Eisenhower cited the C-47 as one of the most important instruments of Victory over Nazi Germany. If you are interested in more such stories of the venerable Douglas DC-3/ C-47/ Dakota, may I recommend you my book “The Dakota Hunter”, 320 pages of adventurous tales, that I experienced in 20 years of travel and expeditions, in search of that Dakota at the last frontiers. Illustrated with 250 never before published photos, this book is surely to become a must read for any vintage aviation buff, interested in the History of the Dakota, the crashed, abandoned and still operational DC-3’s that fly on a commercial base in the outbacks of this world. View my website www.dc3dakotahunter.com where you can take a sneak preview into the book and order directly at Amazon USA/ UK. Also avialable in limited series autographed version. You can follow or friend me at www.facebook.com/hans.wiesman, where you can view more posts and photos.